Definition at line 32 of file link.hpp. Create an empty Link object. Decode a Link object from a Block. Definition at line 35 of file link.cpp. Create a Link object with the given name and delegations. Definition at line 40 of file link.cpp. Definition at line 67 of file link.cpp. 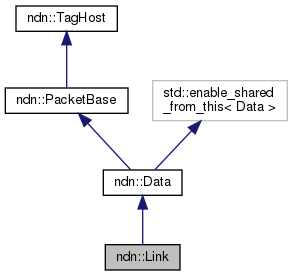 References ndn::tlv::ContentType_Link, ndn::Data::getContent(), ndn::Data::getContentType(), ndn::DelegationList::wireDecode(), and ndn::Data::wireDecode(). Definition at line 84 of file link.hpp. This is more efficient than multiple addDelegation and removeDelegation invocations. Definition at line 79 of file link.cpp. Definition at line 86 of file link.cpp. Remove a delegation whose name is name. Definition at line 93 of file link.cpp.